Feral hogs are simply domesticated hogs that escaped from various farmers pens years ago and reproduced in the wild. But in Texas they’re prolific and very damaging to our pastures, able to root huge 2-ft deep holes along very large swaths of pasture overnight. Their damage not only destroys grazing opportunities for our cattle but also causes damage to our equipment. Thankfully I’m married to a talented hunter-husband and he helps reduce their population by hunting or trapping these hogs and we have the pork processed locally. Our processor has many options for the pork but one of our favorites is smoked ham. Recently I made a sandwich spread from some of that delicious ham. It’s RancherMan’s favorite sandwich spread. First I pulled out the ingredients needed: The ham slices, red onion and garlic cloves from my garden, dill pickle slices and Sweet & Savory Relish that I preserved last year, and salt / pepper. I also needed a dollop of mayonnaise for a binder and a small squeeze of mustard for zip. 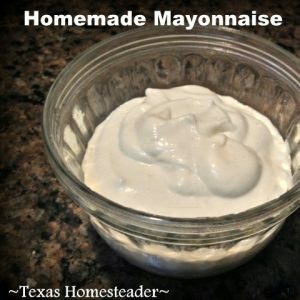 UPDATE: I’m now making my own homemade Mayonnaise these days. So easy! When I make ham salad I really don’t have any measurements. So I certainly don’t have a rigid recipe. If we have jalapenos growing in the garden we almost always chop one up and throw it in as well. But I don’t think there’s much of anything we don’t enjoy without an added jalapeno! That’s just the way we roll here on the homestead. But you can use some of the same ingredients you enjoy in your own sandwich spread recipe. If you like boiled eggs in your sandwich spread – add them. If you enjoy bell pepper or celery – go for it. Sour cream or seedless grapes? You betcha. This recipe is fully customizable to your tastes. I pulled out both my *KitchenAid mixer and the *grinder attachment . This combination has been pure gold in our household and I use it a lot! The grinder makes short work of the ham slices. In less than two minutes they come out beautifully ground and ready to be made into ham salad. Then I simply add my other ingredients to our taste. I like to go pretty sparingly on the mayo and add just enough to bind everything together. You can use the same ratio you’d use in your favorite sandwich spreads. Some people like to go light on the mayo, and some people like a creamier spread so they use more mayo. Whatever floats your boat works here! Give it all a quick folding with a large spatula and it’s blended into ham-salad perfection. I feed good that in making this spread I’m utilizing organic veggies grown and preserved from my own garden, meat harvested from our ranch and a few added condiments to blend it all together – no running to the store for sliced lunch meat. I look at this as a beneficial win/win – fewer wild hogs to damage our pastures and lots of good eating. Hey, that’s just Taylor-Made for us! 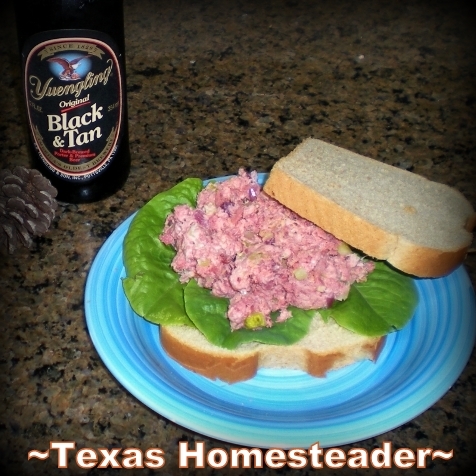 This entry was posted in Blog Posts and tagged Cooking, Environment, Frugality, Recipes on May 30, 2013 by Texas Homesteader. Oh that looks so good, but needs more mayo. You sound like me, no recipe, just throw it in the bowl, and take it from there. Thanks for sharing on Tuesdays With a Twist, I love your posts. While I do not eat any pork, my hubby and son do. We have thought about raising a pig or two, no wild hogs here. 🙂 Thanks for sharing at Wildcrafting Wednesday! Sounds very delicious! Thanks for sharing on The Four Seasons Blog Hop! Sandra from Scrumptilicious 4 You! Wow! I don’t think I have ever heard of a wild pig around here, but that sounds awesome! Not the damaging of pastures, but being able to get some good quality meat by hunting! We have a lot of deer hunters around here. Thanks for sharing at what i am eating! We have a lot of wild hogs here, too. My husband usually just butchers it himself but that means we don’t have things like ham. I’ll have to call around and see if any of our local processing places process wild hog. Thanks for this idea!